Two-factor authentication is a needlessly complex sounding name for a very simple way to secure your email, social media, and most other online accounts. While two-factor authentication technically means you have two layers of security protecting your account – typically, one a password, and the second is usually a one-time password (OTP). So most people who talk about two-factor authentication are usually taking about OTPs. Once you’ve enabled this additional layer of security on your account, you’ll get an OTP via text message or an authenticator app whenever you login to your Gmail or Twitter account, for instance. This means even if someone finds out what your password is, they won’t be able to log in to your account because they won’t have access to the one-time password. It’s always good to have an extra layer of security when it comes to online accounts. Every other day we hear about people’s accounts being hacked online and enabling two-factor authentication is one way to make things difficult for miscreants. Not all sites support two-factor authentication, but we think you should use this security feature on every single site that supports it. Sure, it adds an extra step while you are logging in to your online accounts but remember that it’s also protecting your account. If you don’t want to use this everywhere, we suggest that you definitely enable it on all of your email accounts. As long as your email isn’t compromised, most of your online accounts are also going to be safe. It goes without saying that you might want to avoid email providers such as Yahoo, which aren’t exactly known for providing a good level of security. There are two primary ways to use two-factor authentication – text message or via an authenticator app. Most sites will send you OTPs via text message and that’s a perfectly good method of authentication. However if you go abroad or travel to a place with patchy or no network within your country, then you could be locked out of your account because the SMS will never arrive. That is why we recommend using authenticator apps such as Google Authenticator, Microsoft Authenticator, or Authy or even some password managers such as 1Password. These apps show you OTPs even if the smartphone is in airplane mode. Google Authenticator is quite easy to use and the following steps will show you how to use it for Gmail. The steps are similar for other authenticator apps too. Open Google’s two-factor authentication page. Enter your password as and when prompted. You’ll reach the landing page for two-factor authentication. Click Get Started. Enter the phone number you want to use for OTP. This is just in case the authenticator app isn’t accessible. Click Next. Enter the one-time password sent to your phone. Click Next. 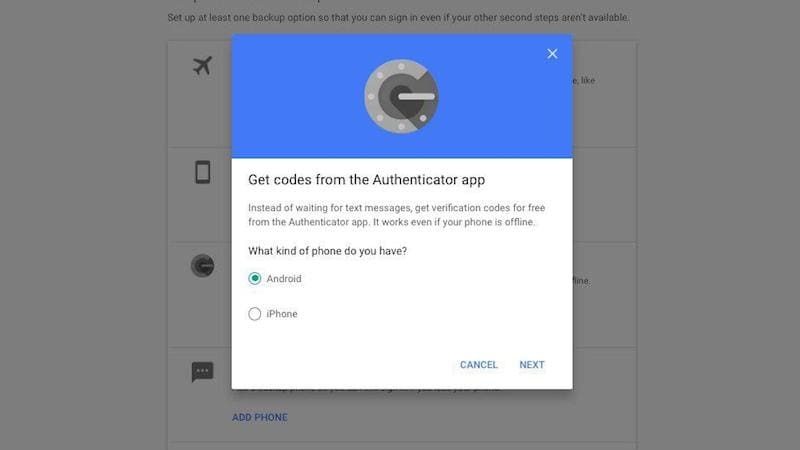 This enables two-factor authentication via SMS on your Google account. Now scroll down and click Setup under Authenticator app. In the pop-up, select the type of phone you have – Android or iPhone. Now you’ll see a QR code on screen. You can either scan this or click Can’t scan it to get a code for two-factor authentication. This is where you’ll have to switch to your smartphone. Download Google Authenticator on Android or iOS. Tap Scan barcode. This will fire up the camera on your smartphone and you can point that at the QR code on the computer screen. Alternatively you can tap Manual entry and enter the code on screen. On the Google two-factor authentication page, click Next. Enter the code on your authenticator app and click Verify. This sets up two-factor authentication on your Google account. For more tutorials, visit our How To section.